Steven (Chicagoland, United States) on 19 December 2016 in Architecture and Portfolio. The island and parish was defined as within United States territory in 1796 under the Jay Treaty with Great Britain settling the border with Canada. It was a thriving frontier community based on the fur trade. The economic growth of the Island's commerce and harbor attracted more Americans. The general indifference by the new American military authorities to the Catholic faith, led to the temporary disintegration of the church's structure of lay leadership. By 1803 Father Gabriel Richard, visiting the parish to offer the sacraments, found that the altar had been desecrated and the priest's quarters adapted for use as a brothel. After the War of 1812, the parish was saved by a prominent local fur trader, Madeline La Framboise, an Ojibwe who worked with a succession of visiting priests to restore the church's status as a place of worship. She also donated land to be used as a site for the church. Father Samuel Charles Mazzuchelli was assigned to Sainte Anne de Michilimackinac in 1830; he was the first resident priest in 65 years. The parish was reassigned in 1853 to what is today the current Diocese of Marquette. With population and economic growth, the church demolished its historic log structure in the 1870s. It replaced it with the timber-framed church, begun in 1874 and completed in the 1880s, that is in use today. As the 300th anniversary of the church's parish record book approached, Sainte Anne Church was recognized in 1992 as a registered Michigan historic site. A state historic marker was erected at the church. 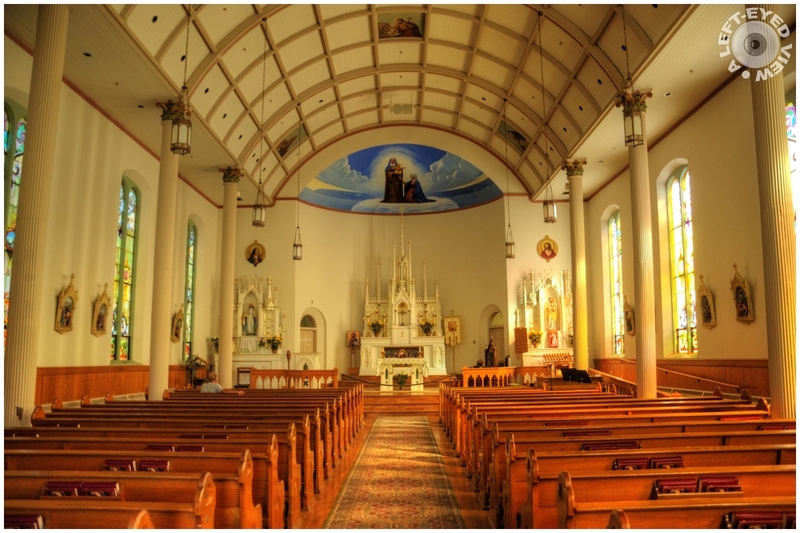 As measured by the continuity of its parish records, the parish of Sainte Anne de Michilimackinac is one of the oldest Roman Catholic parishes in the interior of North America. Magnifique une très belle sobriété ! Ah, yes, this echoes the dignified simplicity we saw in the exterior . . a very pleasing church. Good capture of the inside, interesting explanations. Beautiful capture of the light and a most charming historic church. Great shot. Very nice Pov. I like a lot. Thanks for the info. Excellent image! The light and details are superb. Perfectly framed and captured, Steven. The lighting is wonderful for bringing us all the detail and the mood of this interior. A beautiful shot of the interior. I especially like the ceiling and windows. Nicely composed image of that beautiful church. nice wide angle. very little perspective distortion. Lots of detail despite being mostly a cream and brown duo-tone. Nicely composed photo of that beautiful historic church. Even more, the photo is very well, taking into account the luminosity issues that these buildings usually present.